Natixis AM Funds, most of which have a three-year track record, provide investors with access to fixed income (credit, inflation and aggregate), bonds and emerging market equities, a value approach to European large caps and global allocation. It also incorporates a flexible, quantitative and volatility management approach developed by Seeyond3. Managed by Natixis Asset Management, Natixis AM Funds are composed of 18 subfunds with a total AUM of EUR 2.3 billion as of the end of March 20134. Mirova Funds offers the share management (thematic and cross-thematic) and fixed income expertise of Mirova, the responsible investment subsidiary of Natixis Asset Management. This SICAV is one of the very few in Europe entirely dedicated to socially responsible investment5. Mirova Funds are composed of 7 subfunds with a total AUM of EUR 1.3 billion as of the end of March 20136. 3 The volatility and structures expertise of Natixis Asset Management has been developed by Seeyond. Natixis Global Asset Management is one of the 15 largest asset managers in the world based on assets under management.1 Its affiliated asset management companies provide investment products that seek to enhance and protect the wealth and retirement assets of both institutional and individual investor clients. Its proprietary distribution network helps package and deliver its affiliates’ products around the world. Natixis Global Asset Management brings together the expertise of multiple specialised investment managers based in Europe, the United States and Asia to offer a wide spectrum of equity, fixed-income and alternative investment strategies. Headquartered in Paris and Boston, Natixis Global Asset Management has assets under management totaling €652.9 billion ($899.9 billion) as of 31 March 20142. Natixis Global Asset Management is part of Natixis. Listed on the Paris Stock Exchange, Natixis is a subsidiary of BPCE, the second-largest banking group in France. Natixis Global Asset Management affiliated investment management firms and distribution and service groups include Absolute Asia Asset Management; AEW Capital Management; AEW Europe; AlphaSimplex Group; Aurora Investment Management; Capital Growth Management; Caspian Private Equity; Darius Capital Partners; Gateway Investment Advisers; H2O Asset Management; Hansberger Global Investors; Harris Associates; IDFC Asset Management Company; Loomis, Sayles & Company; McDonnell Investment Management; Mirova; Natixis Asset Management; Ossiam; Reich & Tang Asset Management; Snyder Capital Management; Vaughan Nelson Investment Management; Vega Investment Managers; and Natixis Global Asset Management Private Equity, which includes Seventure Partners, Naxicap Partners, Alliance Entreprendre,Euro Private Equity, Caspian Private Equity and Eagle Asia Partners. Visit ngam.natixis.com for more information. 1 Natixis Global Asset Management (NGAM) is the world’s 15th-largest asset manager based on global assets under management as of December 31, 2012, according to Cerulli Associates.2 Assets under management (AUM) may include assets for which non-regulatory AUM services are provided. Non-regulatory AUM includes assets which do not fall within the SEC’s definition of ‘regulatory AUM’ in Form ADV, Part 1. With assets under management of €294 billion and 633 employees, Natixis Asset Management ranks among the leading European asset managers. Natixis Asset Management offers its clients (institutional investors, companies, private banks, retail banks and other distribution networks) tailored, innovative and efficient solutions organised into 6 investment divisions: Fixed income, European equities, Investment and client solutions, Structured and volatility developed by Seeyond,1 Global emerging, and Responsible investing developed by Mirova2. Source: Natixis Asset Management – March 31, 2014. 1 Seeyond is a brand of Natixis Asset Management. 2 Mirova is a wholly owned subsidiary of Natixis Asset Management. 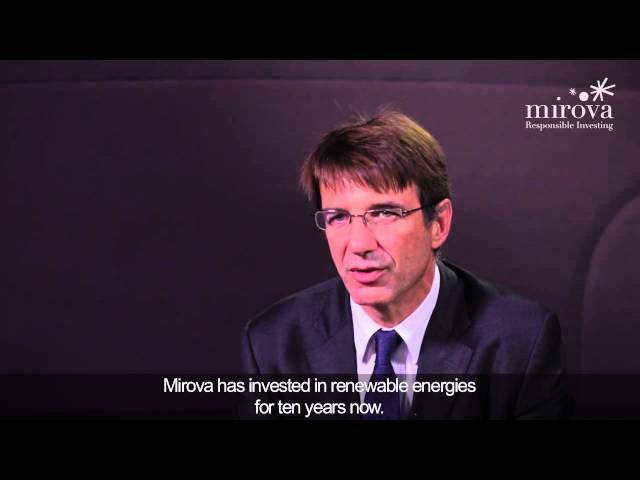 Mirova offers a global responsible investing approach: equities, bonds, infrastructure, Impact investing,1 voting and engagement. The second-largest European manager of open-ended SRI funds2 and N°1 in Impact investing in France3 and in Europe2, Mirova has €3.8bn in AuM and €38.3bn in voting and engagement. Mirova brings together 42 multi-disciplinary experts, specialists in thematic investment management, engineers, financial and ESG4 analysts, specialists and experts in socially conscious finance and project financing. Source: Mirova as of 31/03/2014. 1 Impact investing: investments with a strong social and environmental impact. 2 Source: Feri Lipper - 11/2013. 3 Baromètre Finansol 2012. Impact Investing: of which €55 million invested directly in solidarity organisations. 4 ESG: Environmental, Social/Societal and Governance. Corporate, investment and financial services arm of Groupe BPCE. Natixis is the corporate, investment and financial services arm of Groupe BPCE, the 2nd-largest banking group in France with 21% of total bank deposits and 36 million clients spread over two networks, Banque Populaire and Caisse d’Epargne. With around 15,000 employees (excl. financial stakes), Natixis has a number of areas of expertise which are organized in three main business lines: Wholesale Banking, Investment Solutions and Specialized Financial Services. A global player, Natixis has its own client base of companies, financial institutions and institutional investors as well as the client base of individuals, professionals and small and medium-size businesses of Groupe BPCE’s two retail banking networks. Listed on the Paris stock exchange, it has a solid financial base with a CET1 capital under Basel 31 of €12.7 billion, a Basel 3 CET1 Ratio1 of 10.6% and quality long-term ratings (Standard & Poor’s: A / Moody’s: A2 / Fitch Ratings: A). Press release "Natixis Global Asset Management announces two new Luxembourg-based SICAV's"